Bolivian architecture has no end to Indian motives. Till 1690 its architecture was under strong influence of Indian culture which led to creation of a new style of mmestizo or Andes Baroque which existed till the XVIII century. This style was used all over the country and its peculiarity was in usage of Indian ornaments and typical Indian motives of pre-Colombo architecture. Important archeological ruins, stone monuments, gold and silver ornaments show the high level of advanced social organization. Not everybody knows that Bolivia was a country who firstly welcomed Incas who in their turn built roads, hanging bridges and introduced medical and social practices. Incas main architect ruins are located in Tiwanaku, Incallajta, Iskanwaya and Samaipata. These places are indescribable; they have their stories that impress even an experience traveler. Though Bolivian architecture is not as famous as the European one it will surely surprise you but its quantity and diversity. 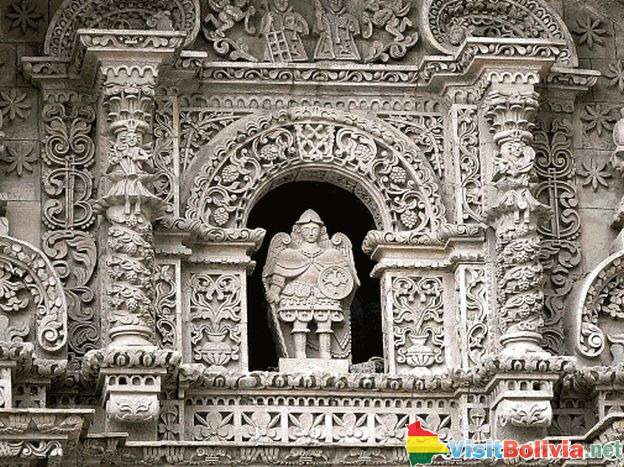 Spanish brought their culture and architecture which Bolivians turned into Mestizo Baroque. This era produced talented sculptors, painters and woodcarvers that made their masterpieces churches and various religious buildings. One of the greatest examples of Bolivian architecture is a Convento de Santa Teresa. It is a timeless and delicately decaying complex will surprise you by its graceful beauty and will let you in a world of wonderful history. The building can be only visited by guided nuns that inhabit the Convento. Peaceful nunnery has fine sculptors and altarpieces that belong to the Potosi school. Visit to the Convento de Santa Teresa will give you’re an incredible opportunity to climb to the top of the roof that gives amazing picturesque view of the city. Mestizo Baroque is brightly shown in an Iglesia de San Lorenzo de Carangas. This church is probably the most photographed spot in Bolivia. Baroque portal was carved in stone by one of the most prominent master of indigenous artisans in 1744. One of the best items of the iglesia is a handmade silver altar. Extremely beautiful La Capilla Nuesta Senora Jerusalem was originally built as a small chapel in honor to Virgen de Catelaria. When in a capilla don’t forget to visit a wonderful golden retablo – where Virgin Mary is placed in the center surrounding by numerous Biblical paintings on the walls. One more attraction of the place is the impressive room that has paintings by a famous Bolivian Melchor Perez de Holgun. The most famous sculpture of Dark Virgin Marry is situated in a small town Copacabana which is on the banks of the beautiful Titicaca Lake. It is a creation of a prominent Bolivian architect Francisco Tito Upanka. Francisco dedicated his life to the development of Bolivia and its art and till recent days is known in Bolivia and outside the country. Bolivian architecture is like a good book: it has its beginning, its mystery and you will never know what is coming next.